Built 118 to 138 A.D. by Emperor Hadrian probably born in Italica, a Roman colony in Andalusia, the enormous villa occupies an area of about 30.000 acres on a vast tufaceous plateau between two streams called Ferrata on the East side and Rocca Bruna on the West side. 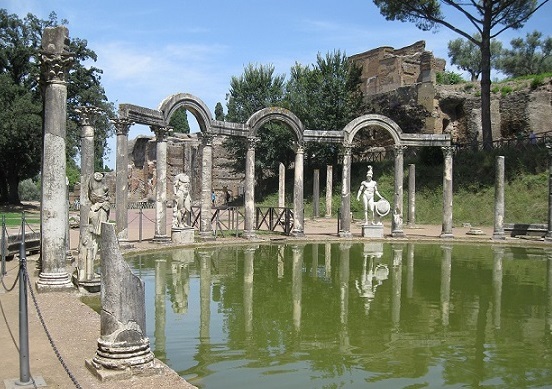 In order to realize such an immense construction, Hadrian decided to move out from Rome, choosing a territory green and rich in water, near the ancient Tibur (today Tivoli), 28 km East of Rome, at the foot of the mountains Tiburtini. Historical sources repotrs that Hadrian, a very versatile personality, loved in a particular way the architecture, to which he devoted himself. The constructional characteristics of the Villa, different from the typical architecture of that time, makes it clear, beyond any doubt, that he has participated in the project. In Rome, a typical example of his competence is given by the Temple of Venus and Rome, built between the Colosseum and the Roman Forum. Also the Pantheon, renovation of the former temple built by Agrippa, that some scholars attribute to the architect Apollodorus of Damascus, was re-built in a completely new shape and innovative techniques. Another well preserved monument in Rome designed and directed by Hadrian is Castel Sant’Angelo, originally the tomb of the emperor and in the following times turned into an impregnable fortress by the Popes. The Villa at Tivoli includes thermal baths, nymphaea, elegant pavilions, gardens distributed in an original way, not reflecting the typical arrangement of many other imperial villas. The various rooms were connected to each other, not only through surface paths, but also through an underground road network for the essential services. The architectural decoration of the Villa was extremely rich and since the Renaissance it has been the subject of frenetic interest. The plundering of the precious marbles that took place already since the Medieval Age causing such a dispersion of the decorative elements, that almost all the main Museums and Private Collections in Rome, and the rest of Italy and even in Europe count among their masterpieces many specimens from Hadrian’s Villa.